“Wood duck drake” watercolor painting by Fran Vail. 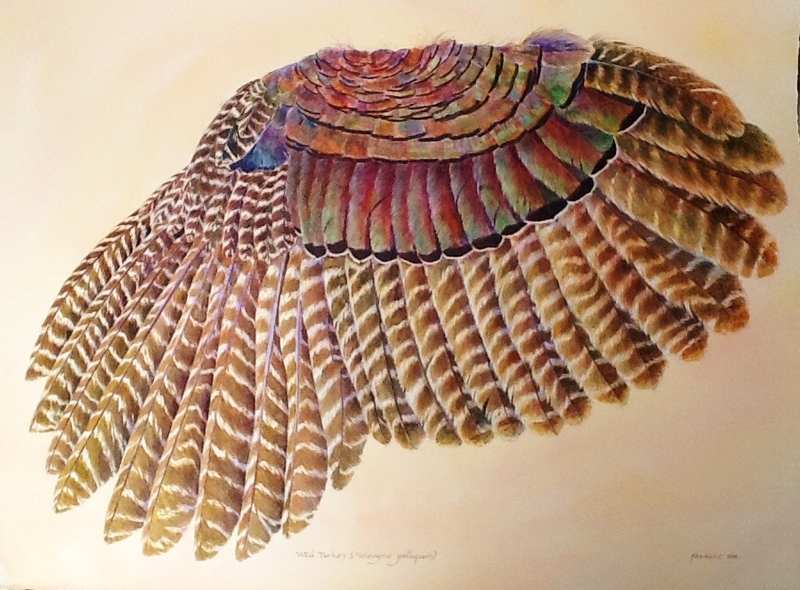 An Illinois artist with a passion for birds and watercolors is giving bird watchers, hunters and wildlife enthusiasts a new perspective on Midwest game birds with an exhibit of paintings that capture the complexities of various species’ wings. 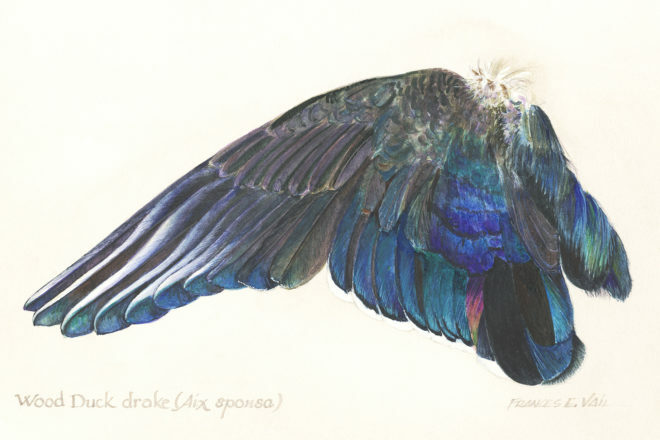 “Watercolor Wings,” part of the Reflections on The Ridges art and lecture series, is the work of professional artist Fran Vail, a Jack-of-all-trades in the art world whose professional career has included work in graphic design, fashion illustration, advertising, mural painting and architectural renderings. 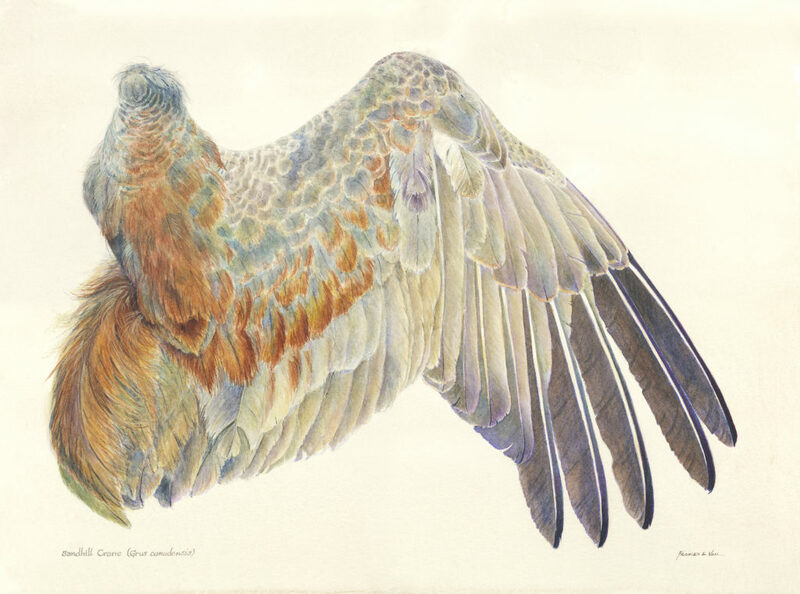 Though best known for her “loosely realistic” watercolor paintings of landscapes, still lifes and portraits, Vail was inspired to paint wings after taking a class led by renowned Illinois watercolorist Peggy Macnamara, artist-in-residence at Chicago’s Field Museum of Natural History. Though advertised as a watercolor class, Macnamara presented students with a variety of specimens from the Field Museum’s collection. “Pintail drake” by Fran Vail. 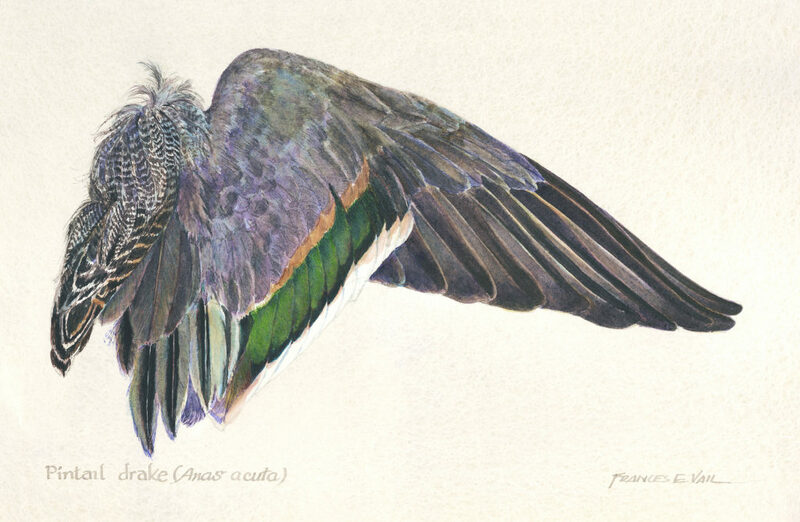 Vail was immediately taken by the challenge, and reward, of replicating the subtle shades and iridescence of bird wings. The fact that they had been removed from the birds’ bodies didn’t bother her, either. Since then, Vail has built a collection of paintings showcasing the underside of wings from birds of all sizes, from the Blue-winged teal to the Sandhill crane. The process of collecting and preparing the wings for studio time is almost as tedious as the process of painting them, she explained. “Wild Turkey” by Fran Vail. Upon delivery, wings go directly into the freezer until she is ready to work. When the time comes, she removes the frozen wing, dries it in an open position, and pins it onto 300-pound Arches watercolor paper before tracing the outline. With the basic shape in place, Vail removes the wing and, using it as reference, sketches each feather freehand. The painting process begins with pale washes of color “and continues through as many as 20 or more layers of pigment until I’m satisfied with the final hues, values and textures of the wing.” The final step is penning the Latin and English species’ names on the bottom of the artwork, a step that can take upwards of three months to arrive at. “Sandhill Crane” by Fran Vail. In the last three years, Vail has painted wings of 15 of the Midwest’s most recognizable feathered creatures, from the Snow Goose to the Wild Turkey, with the hope of giving viewers a newfound appreciation for the rarely seen side of these birds. Fran Vail’s art will be on display throughout the month at The Ridges Cook-Fuller Center, 8166 Highway 57 in Baileys Harbor. For more on the artist, visit FranVailArt.com. For more information on the exhibit, visit RidgesSanctuary.org.